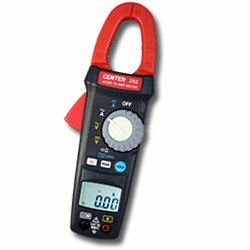 The CENTER 252 is a True-RMS clamp meter capable to measure AC and DC current/voltage, with 0.01A/0.1V high resolution. It also comes with 1ms Peak Hold function for fast capture of signals, and Zero function to easily analyze data. No matter in self-employed, industrial maintenance, or professional applications, the CENTER 252 brings a reliable, accurate, and convenient solution.